FIXYOURTHINKING.COM / Need a brain? Borrow mine! : The Creation Museum: In One Day I Saw All Seven! I must give credit where credit is due. 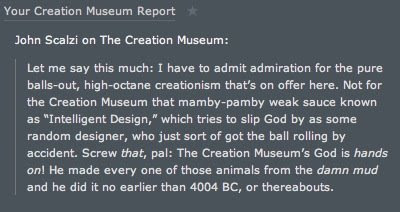 I hadn't heard anything about the Creation Museum, until I saw a brief post on John Gruber's Daring Fireball in November of 2007. One doesn't have to read Gruber's website a lot to know that he is obviously atheist, agnostic, or a combination of the two. Every couple of weeks or so, Gruber will post a blurb in his "linked lists" about a blog or "well known atheist" (like Richard Dawkins, an evolutionary biologist) that says something critical about Christianity or organized religion. The Creation Museum is located in Petersburg, Kentucky - near the Cincinnati Ohio border and within just a few miles of The Cincinnati/Northern Kentucky Airport. It is a based on a detailed scientific display of the first few chapters (1-8) of of the book of Genesis from the Holy Bible. Readers ... I am a Christian. I was created by God Almighty. I was given salvation by Jesus Christ and through him everything positive, productive, and creative in my life flows. I am also a skeptic. I am a believer in evolution. I am believer in science and to me science has no designation of being secular or "God's Design". The documentaries in the Book of Genesis in the Bible are just as real to me as the biography and life work of Charles Darwin. Evolution has mutated since Darwin's discoveries into an evolution and origin of everything - not just life. I don't believe that evolution is the complete answer, the complete correct answer, or the only answer to our existence and the existence of all that we know and see. 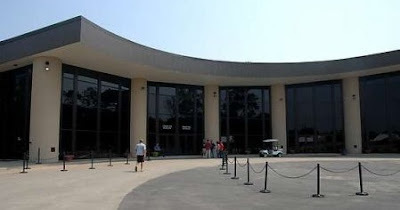 The review of The Creation Museum below is formed from my own opinion both before and after visiting and following up over the last two weeks with careful and concise research into the science the museum uses, the background of the founders of the museum, and the evidence that is often used to refute such information. I love to be challenged ... to be stumped ... to be told something is impossible. Because I know that through God ALL things are possible. Atheists, Agnostics, Religious Haters latch on to the theory of evolution and scientific testing as it itself were a religion. The truth is, there is nothing written that has been discovered that can confirm anything is older than 6000 years. Writing is believed to have started in the 4th Millenium BC. All carbon dating (and other dating techniques), all of the theory of evolution beyond 6000 years is merely speculation - faith in science. Ask yourself, without being foolish or oblivious to fact, is there any way whatsoever that we know something ... anything is greater than 6000 years old? "Beloved, be not ignorant of this one thing, that one day is with the Lord as a thousand years, and a thousand years as one day. ... meant that it is possible that those "Days Of Creation" were the millions of years that we all accept. I still believe that way. The Creation Museum presents (read as; does not force) the theory that it truly was six actual 24 hour days and that God rested on the seventh day. I do know that God is powerful enough to have snapped his fingers and spent a few minutes more perfecting and that all of creation could have been created just as the Bible says. However it is not errant of me to believe that every word of the Bible is true and to believe that a day could have been a million years. My best friend made a very poignant statement when I discussed my trip to The Creation Museum with him. Why has everything come so far, so fast in such a short time? For me, it is logical to see that there has been intervention, rather than evolution. Evolution to me is a way of explaining survival of the fittest and procreation of the desired - not the development of new species. Darwin was a genius to make the discoveries he did - but did he discover a process that could be easily reproduced or did he truly discover a way to finally debunk the creation theory? Evolution is not modern science. Many think that just because Darwin's work was accepted during his lifetime and then became widely known by the 1930's - and lead to the general acceptance of today; that it is a new enlightenment - that it is the way "rational thinkers in the age of knowledge" are to accept. Be careful when someone uses the word "only". In the many references for this piece that I have about Darwin - it seems as though all of them say evolution is the only way to explain "the diversity of life". The Creation Museum is very careful to present the evidence as they see it and carefully relate it in a very detailed manner to the Bible. At no point did I see or hear anything at the The Creation Museum say that it was the "only" way this or that happened. A narrow mind thinks in the absolute and has the word "only" on the brain. One way, in which The Creation Museum convincingly shows the case against the "thousands of years or millions of years of evolution theory" is by showing you how dogs in the modern age developed from what is nothing more than a wolf, dingo, or wild dog - all with the assistance of man breeding different characteristics over just a few generations of canine offspring. They show how man has created the "evolution" in a very short period of time. In just a few hundred years we have been able to produce over 800 different breeds of dogs - that would all seem like completely different animals. One of the draws of The Creation Museum is its dinosaur display, exhibit, and theory. "Where does The Bible talk about dinosaurs?" Many think that the book of Genesis simply dismisses them from creation. The Creation Museum presents the passages in the Bible where dinosaurs are mentioned. They also convincingly present evidence of dinosaurs throughout history. One premise The Creation Museum presents is that it would be next to impossible to come up with the vision of a dragon. 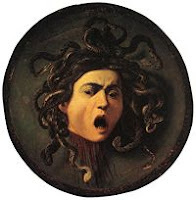 They posit that most fantasy is of positive imagery or simply farcical - such as beautiful mermaids or Medusa. "Would you mistake an elephant or a giraffe for a dinosaur?" "David googled and could not find the answer, so he prayed." The Creation Museum does speculate on an answer for "dinosaurs being mentioned in the Bible". * When I say "speculate" - I mean just that. They don't throw all of this in front of you via a sermon or condemn you for not believing, they ask that you consider their answers. The Creation Museum at no point seemed like a church preaching or a scientist teaching. It felt exactly like a learning experience in the same way that EPCOT in Disney World is or like a trip to the Smithsonian would be. Why not just say "elephant" if that's what "behemoth" was? I went to The Creation Museum to see for myself whether or not this is some religious fanaticism and crazy theory. I also wanted to see if this was some creative way to get money to make religious predator's pockets fatter. I wanted to be the first (it seems) to review The Creation Museum without bias. You cannot expect a preacher, a biology teacher, an evolutionist, or a revolutionist to give you a non bias review of such a place. The presentation of the museum is wonderful. The creativity, design, and overall detail is incredible. It's not meant to be eye candy for believers or technological trickery for non believers - even though it may seem as such to those who specifically want to criticize the museum. This Saturday, I made my much anticipated field trip to the Answers in Genesis Creation Museum, a $27 million monstrosity devoted to religious fanaticism, disguised as “science”. Two of my heretical friends and I ventured an hour north up I-75 from Lexington, just short of Cincinnati, to discover a museum full of shocking idiocy and unintentional humor. You owe it to yourself to visit The Creation Museum to at least be entertained for a day. If you're a creative person or a designer it's worth going just to get a look at an example of excellent design for a venue or presentation. To me, it is one of the most compelling Christian presentations ever done - second only to Passion Of The Christ in my opinion. I consider myself, as do others, to be a very rational person. It just seems that The Creation Museum has chosen to allow one review by a fanatic to be on their website, and that several of the critics of the museum found the crazy people to interview for their YouTube exposes. I thought it was desperately needed for a positive review to compel everyone to go see this incredible place. If you've ever wondered about there being "no proof" of God, or the creation from a divine intervention; this venue certainly makes you think with a presentation of real science and was given obvious detail and dollar to many years of research. If you are a skeptic, an atheist, or an agnostic your reading and accepting other negative reviews about this is being dishonest with yourself - if you consider yourself to be rational. After all, there are lots of poor reviews of Paris France and Disneyland! Are you going to let everyone else have the fun that wants to see for themselves? [UPDATE] Comment posting on this story is turned off, please DO NOT comment on this story on other posts. You may send me direct comments if you wish that will not be published.